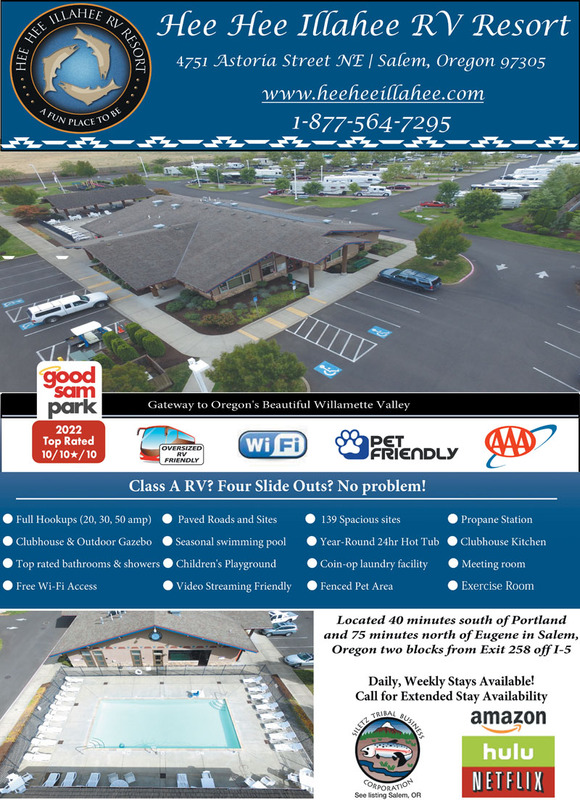 In the heart of the Willamette Valley, EZ-ON/EZ-OFF I-5, come enjoy our resort with upgraded fiber internet circuit for real Wi-Fi or enjoy our relaxing spa, fitness center, game & meeting room or swim in our seasonal pool. We made reservations to stay 8 nights but when we checked in, we were told we would have to move for the last night so we changed our travel plans & departed after 7 nights. The park is a short drive from I-5 (Exit 258) along busy multi lane city streets. The intersection off the main street onto the side street where the park is located is controlled making turns onto the street easier. The interior roads are paved. The interior roads have sufficient width and gentle turns making maneuvering larger RV’s easy. There are 3 sections to the park. Two of them seem to be for extended stays (by the month). The third is for shorter stays. There is a mixture of back-ins and pull through sites. This park doesn’t seem to understand the simple concept of the importance of a flat. The park was built on a gentle slope but there was no attempt made to tier any of the sites so most of the sites generally have a bi-directional slope. The parking pads are concrete. They have full hook ups – water, electricity (50/30/20 AMP), & sewer. The utility connections were spread out along the middle to rear of the sites. The sewer connection was at ground level making it easy to establish a downhill flow depending on discharge point. The P/T sites were long enough to say connected to a toad unless you connect to the utilities then you’ll need a lot of hose/cable to reach the utility connections while remaining connected to your toad.. Sites had sufficient room for opening slides. Sites have an outside table but no fire pits. Site orientation doesn’t allow RV’s to cast shade onto the patio side. Distance & grassy areas establish privacy between the sites. There are trees scattered throughout the park so satellite reception would be dependent upon your site and dish configuration. The park information listed about 66 cable channels but didn’t mention anything about broadcast channels. Didn’t try to get any broadcast channels. The park provided WiFi was good. It was password protected. Our Verizon WiFi hotspot and NET10 phone had good reception. There is one designated fenced pet area with a grass surface on the North side of the park and two other unfenced designated pet areas on the West side & near the office. There were bag dispensers and collection stations for waste in the pet areas. There was sufficient area to walk dogs along the park’s roads. We generally stay here when in the area. TIP: Park is conveniently located to services. Dominos and Schwan’s delivered to the park. We stay here from time to time. The park is very neat and clean and well taken care of. The sites are pretty narrow but no more narrow than most parks. There are quite a few full timers but they are located in two separate areas and their sites are always neat and clean. The management here is friendly and helpful. 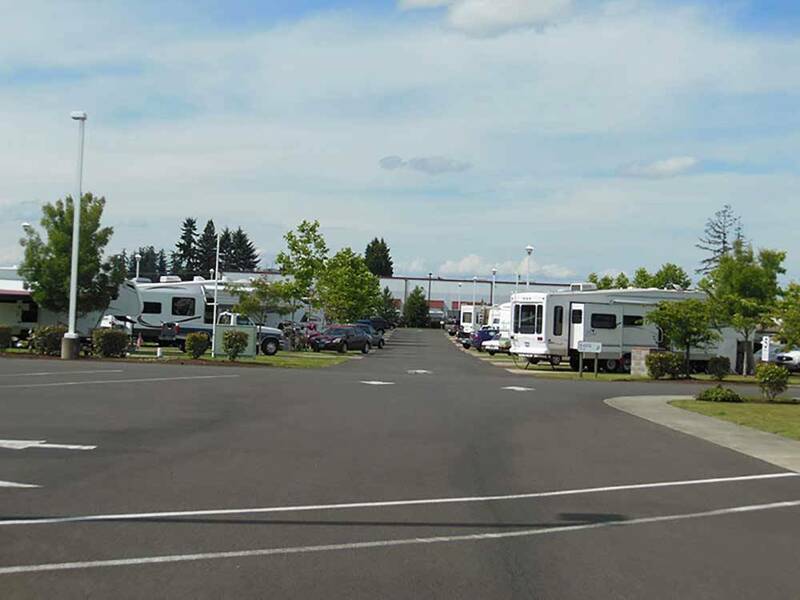 This is a beautifully maintained RV Park. It is not a destination resort. The grounds were perfectly maintained. Hook-ups, wifi, and satellite connectivity were excellent. Our pull-through site had a cement pad and grass, long enough but a bit close on the sides. Interior roads are well-maintained and there was plenty of room to maneuver our 42 ft motorcoach and towed car. It was quiet and orderly. Several seasonal/long term RVers but in good repair, not junky. Found some decent books in their exchange library. Good nearby golf. Convenient to downtown Salem. You must go to a wonderful and funky restaurant there called Word of Mouth. Be sure to make reservations early in high season. Salem is a city for young & young-at-heart. Ride the Riverfront Carousel, explore parks & nearby gardens from tulip farms to the Oregon Garden. Visit dozens of wineries & play local golf courses. Stay here, get out and enjoy!